We are attempting a FIRST: A kayak expedition around Spitsbergen/Svalbard, half-way between Northern Norway and the North Pole, by folding boat! The Spitsbergen Archipelago, also named Svalbard, is situated half-way between the most northern point of Norway and the North Pole, in the middle of the Arctic Ocean. In the last few years, this remote and barren land made headlines because of increased melting of the glaciers and it's ice cap, due to global warming. This will be the place for our kayak expedition. Presently, we are two expedition members: Jürgen from Mülheim, Germany and Heike from Cleveland/Ohio, USA, planning to circumnavigate the island of Spitsbergen, the largest island of the archipelago, and the more easterly situated island of Nordaustlandet by kayak. At the beginning of May 2010 I will transport the equipment to Spitsbergen and begin the kayaking expedition in early June, starting from Longyearbyen, along the western coast of Spitsbergen, heading north, starting the circumnavigation in a clockwise direction. Heike will join me in mid-June in the town of Ny-Ålesund, two weeks into the expedition. Once we reach the north end of Spitsbergen, the crucial decision has to be made: to either continue the expedition by circumnavigating Nordaustlandet or to take the short-cut through the Hinlopenstretet, along the eastern coastline of Spitsbergen. The success of this expedition totally depends on the weather. Some summers are cooler than others. In these years the sea ice never retreats completely. The west coast of Spitsbergen is usually ice free from May on, since the Gulf Stream has a strong influence. However, the northern and eastern coasts can stay iced over for years in a row. We might have to turn around before we even arrive at the Hinlopenstretet, and paddle back to Longyearbyen. IF we are able to circumnavigate Nordaustlandet, it will be a FIRST, though! The total distance, including Nordaustlandet, will be around 2000 kilometres (1240 miles/1080 sea miles). It will take us 70 to 90 days of paddling, plus another 20 to 30 days for bad weather and/or layover days, to watch wildlife and hike in the mountains. 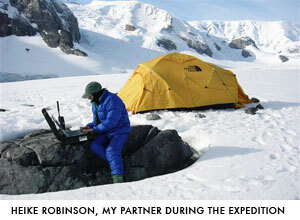 We plan for the entire expedition to take between 5 and 6 months. I will stay at least a month in the area of Longyearbyen. We will transport provisions for 3 months in our kayaks. To draw attention to the problems caused by global warming, endangering the survival of Polar Bears and other Arctic wildlife. To document the beauty of these islands in pictures, sounds and words.